This week’s free recycled crochet pattern features an evening bag crocheted using cassette tape and ribbon yarn. The front flap is V-shaped with a Gold button embellishment and a Velcro button for a closure. I had some materials left over so I decided to make a little cozy to go inside the evening bag. You could use the cozy to hold your ID or a credit card. I did not put any embellishment on the front of the cozy but one could be added if desired. I used two strands of cassette tape and one strand of Lion Brand Trellis ribbon yarn. You hold all three strands together as you crochet. I have found that using just cassette tape as your “yarn” isn’t as smooth to crochet with as other materials. But adding the ribbon yarn really gives your “yarn” a smoother, stronger texture and the crochet hook moves easier. 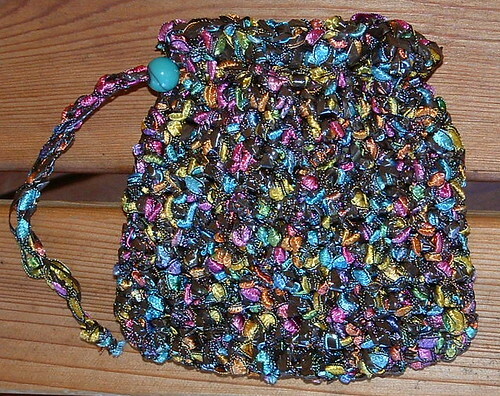 I used Champagne #51666 for the ribbon yarn and it really set off the cassette tape to create a pretty evening bag. I tried several times to take some clearer pictures of the completed project but the light just doesn’t do these materials much justice. Trust me when I say that the combination of cassette tape and ribbon yarn is beautiful together. Plus it’s a wonderfully eco – friendly recycled craft! Purse measures 7 inches wide and 5 inches long. Cozy measures 3 inches square. Chain 28 using 2 strands of cassette tape and one strand of Lion Brand yarn (for purse). This week’s bag is a recycled little purse crocheted from plastic tan grocery bags and brown cassette tapes. This was an interesting and challenging project. Unfortunately I found out that cassette tapes come in several shades of browns after I was halfway done with my bag. I finally had to make my bag much smaller than I had planned. I couldn’t find the same shade of brown cassette tape that I started the project with so my purse became the little bag you see in this post. The strap measures about 37 inches untied. I tied it in a knot at the top to create a shorter strap. Variations of this bag can be made using all plastic bags or any other recycled materials that you may want to substitute. The overall size can be increased by adding additional rounds as desired. Have fun with this week’s bag and enjoy your recycling and crafting project. Hook: E metal crochet hook used in this Motif pattern.